Just beautiful! Only seven colours; four shades of blue, two of mauve and a cream background. The body of this lively dragon is worked in shades of green with its head and tail in shades of pink. It is breathing red, orange and yellow fire. The dragon's background is off-white and bordered in green. 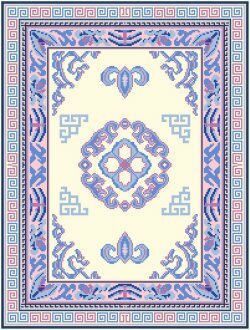 This rug is a companion to Bobbie's Green Dragon Bench only with a pale blue main field. The outside border pattern is various Chinese symbols in greens and pinks on an off-white background. This striking Persian carpet is stitched with only seven colours but makes an impressive statement in any room. The colours are green, navy, beige, peach, medium blue, ecru, and gold on a red background. It has always been a favorite with our customers. You asked for the larger Daghestan in red and here it is! 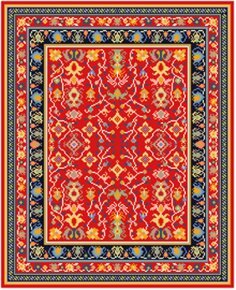 There are eleven colours in this magnificent rug; coral, peach, pumpkin, gold, taupe, three shades of blue, green and cream on a red background. Pink, green, ecru, two shades of blue and two shades of gold all on a red background.